LANCASTER— For some seniors, the ringing of the bell became an opportunity for the nation to hear their voices for the first time. Tuesday, Lancaster Seniors of voting age participated in the “Stroll to the Polls” event to cast their vote. Lancaster High School Social Studies Teacher Teffonee Taylor-Anderson is also happy to help shape the understanding of the electoral process and to see the students participate in this civic duty. “They get the reward of knowing they have a say-so in the political life of this country. Engaging them in the elections—be it federal, state or local—gets them prepared to be responsible citizeens. This is one of the goals of the district,” she said. This annual event started five years ago as a part of Lancaster Independent School District’s More Than a Diploma initiative. The goal is to establish a culture of excellence in the city and school district. They are to set an expectation that after graduation from high school, they would have an array of choices, opportunities, and the ability to make good decisions that can lead them to becoming productive citizens. 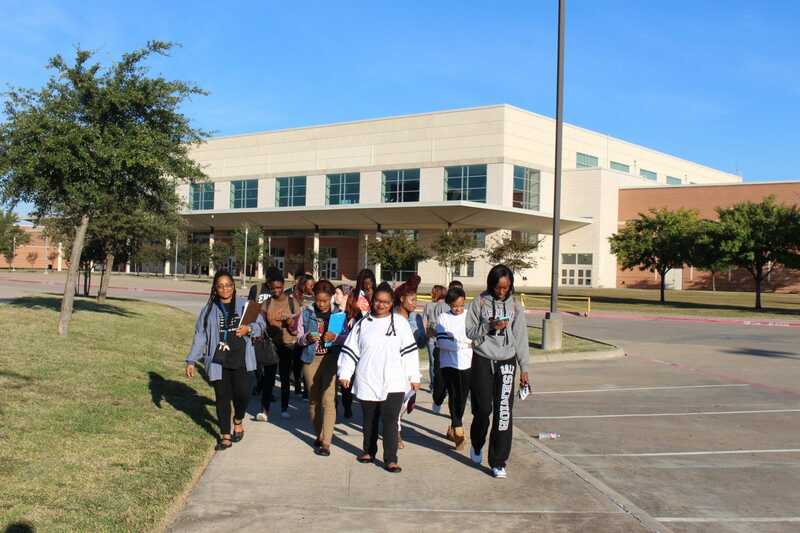 Twice a year, teachers and chaperones walk with students from the high school campus to the Lancaster Veteran’s Memorial Library to vote during the early voting period. Lancaster Senior Kora Darden really connected to the experience.